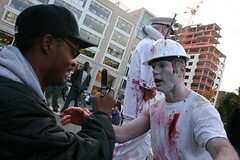 I posted about the Zombiewalk earlier today. I made it to the start of the walk to take some pictures, but then I had class. Enjoy! Ah, this is just one of those things that could only be in New York.